You are warmly welcome to the VRA Schools, comprising a group of private schools owned by the Volta River Authority, located at Akosombo, Akuse, and Aboadze. You must count it a life-chance to be admitted to these reputable institutions. It is our hope that you will appreciate the opportunity of being here, and use all the available facilities the Schools offer to your fullest advantage. Akosombo is in the Eastern Region of Ghana. The environment is classic and the scenery breathtaking. There are hills and valleys, a serene Lake (the Volta) and the world’s famous Akosombo Dam. The town boasts of good infrastructure. The township is properly laid out with well-paved streets, which are brightly lit at night. For tourists on a pleasure trip, there is the Volta Hotel, and the Volta Lake Transport. It is little wonder that Akosombo was nominated as the most well planned and neatest town in Ghana in 1996. 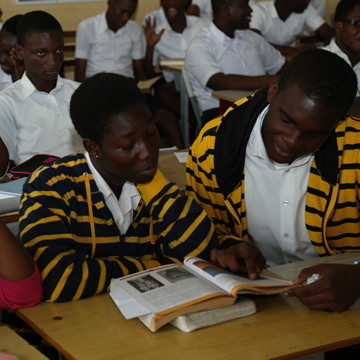 It is within a conducive environment such as this, that Akosombo International School is located. The surroundings are most congenial, and the School has almost everything you will want to have at a good educational institution. Akuse is also in the Eastern Region of Ghana. It is a coastal grassland with warm temperatures. The environment is classic and the scenery breathtaking. There are hills and valleys, a serene Lake (the (Volta) and the Kpong Hydroelectric Dam. Aboadze is in the Western Region of Ghana. The environment is classic and the scenery breathtaking. Our staff members constitute our single irreplaceable asset. They are knowledgeable, focused and diligent, willing to sacrifice their time and energies in ensuring that students put in their charge excel. The House Staff in charge of the boarding houses located at Akosombo are more than surrogate parents. No student is just a face and a name; all their needs are identified and catered for. Indeed, VRA Schools stand for selfless service, moral discipline, hard work and academic excellence. It is our vision to continue to nurture young people to be well balanced, highly motivated, with enough courage and determination to face life’s challenges no matter where in the global market place. It is our ardent desire to make all VRA Schools places of serious study, with avenues for all students to develop their creativity, aptitude for the Arts, Sciences, Music, IT, Business, Sports and Games, etc. We wish to harness every talent in our budding young people for the common good. To you parents and guardians, we say, the best way to get to know all that VRA Schools have to offer is to stay in regular contact with the Schools. By doing so, you will be kept informed of all the meetings and functions of the Schools. Please arrange to attend PTA meetings, and enjoy a cordial relationship with us. I look forward to meeting you in the new school year, and trust that your association with the Schools will be everything you hope for. Once again, you are welcome.